Overall this was a fun sequel and I enjoyed returning to this series. But at the same time some things I didn’t enjoy as much as I hoped to. I struggled getting into this book, there were a lot of characters and I didn’t fully remember at first who was who, so it took me some time before I remembered who everyone was. And then we get a bunch of new characters as well and it was hard to keep them all separate for a bit. 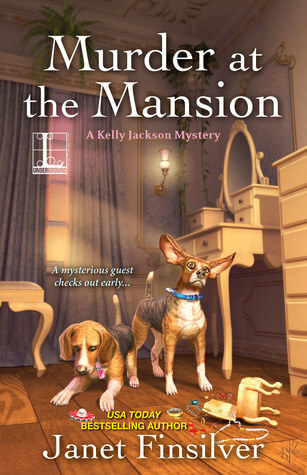 I also was a bit sad that this book doesn’t take place more at the B&B, I was looking forward to see Kelley start her new life there, but instead there is a mansion close by where a lot of the mystery took place and Kelley is helping do inventory there instead of working at the B&B as that was getting renovated. I did end up enjoying it eventually, but at the beginning I was a bit disappointed. It’s one of those books that does get better as it progresses, after the bit of a slow start for me, the pace picked up and I enjoyed the mystery. There was something that bothered me at first as it felt a bit unrealistic, but it later ties into the mystery. It still felt like that part was added in just so the main character could find something later, but maybe that’s just me. The mystery was nice enough, even though it didn’t fully hook me. It starts with the victim still alive and it was obvious who was going to be the victim. Then at first it seemed there were too many possible culprits and not enough clues, but after that things start coming together. I wasn’t too surprised by who the murderer was and the whole reason surrounding it just felt a bit off, although I did like the link to the past and how that tied into the mystery. But even though I wasn’t surprised by who the murderer was I also felt that looking back there weren’t a lot of clues specifically in this persons direction, more some general clues about the length of the person etc. But for all the things that felt a bit off or I didn’t enjoy as much as book 1, there were also some things that I really enjoyed about this book. The characters and their friendship and interactions are definitely one of the highlights. Kelly make some good friends in the first book and we get to see most of them again and I really liked the cozy and close feel of this town. And the Silver Sentinels help again with the mystery. There are some scenes were she is enjoying the company of her friends that felt very happy and it was nice to have those scenes as well. I also liked the new character we met in this book Stevie with his two Beagles. I like how the most of the side characters and even the animals feel real. Too bad the new characters we met at the mansion stayed a bit flat. I don’t really care for the romance, but luckily it’s only a few small scenes and not much happens between them. To summarize: I enjoyed returning to this town and the tight group of friends. It was a fun read, but I felt it wasn’t as good as the first book. The setting changes slightly and now takes place at a mansion and while I understood why, I would’ve liked to see more of the B&B. The mystery had some nice ties with some historical events and it was interesting enough. Who the murderer was didn’t surprise me, but at the same time there weren’t as many good clues in this person’s direction. I don’t really care for the romance. I do like most of the characters and I like seeing them interact. There are some great side characters and I enjoyed reading about them and this small cozy town. What’s the last book with a mystery you read? Hard when a book takes a while to grab your interest or when the reason behind the mystery doesn’t entirely make sense. But I do like the idea that the friends part is done well. The friends part was one of my favorite parts as they just felt like a great group of friends. Lol I had to smile about your comment you wouldn’t recommend it to me, but it does sound like a fun genre mash :). This one sounds like there are parts that work, anyway thank you for sharing. One of the best murder mysteries I’ve read this year is The House With No Rooms – it’s part of the The Detective’s Daughter by Lesley Thomson and is beautifully constructed. I love Thomson’s scene setting and the weight of backstory and detail she packs into her books. It sure had parts that worked and I really enjoyed book 1, so I hope book 3 is better again. I don’t think I’ve heard of that series before, will have to look it up. When a book grabs you from the first page it much easier to get into the book, although this one did got better as it progressed. I’ll look up that series! The first book was really good and had a great mystery, I guess my expectations for the second one were a bit too high. The setting is really fun. Aww, that is disappointing that it didn’t take place where you wanted it to since you were looking forward to that :-/ Will the next book take place at the B&B though since you said it’s just being renovated? Sorry the mystery didn’t fully hook you, but it sounds like the scenes with the MC and her friends were nice. It is nice in books when there are some scenes of the characters just getting to relax and have fun. And the animals look cute! By the way, I sent you an email. No rush, just wanted to let you know in case it goes to your spam or you don’t get it or something. I hope the next book will take place at the B&B again, not 100% as it isn’t released yet. I like B&B settings, so it was a shame this one didn’t take place there a lot. It just felt a bit disappointing as that was the setting I already knew and wanted more of. I have serious trouble remembering characters sometimes. In this case they already had quite a big group of characters from book 1 who seemed pretty well developed, but the newer characters less so. And it did take me some time to remember everyone, a reminder would’ve been nice. I really liked the scenes with the main character and her friends. And the animals were adorable. Your e-mail didn’t land in spam, but you already knew that as I replied by now. I really am behind with comments again. Thanks for sharing! I do want to read more cozy mysteries. I’m sorry this one wasn’t that great though – with it having a slow start, etc. I still would recommend this series, the first book was really good. I don’t read a lot of mystery stories so I don’t remember the last one. It’s been a while for sure. Sorry you didn’t like it as much as the first one but that cover is so cute. It sure is a cute cover and the dogs in the story were adorable too! I started reading cozy mysteries last year and it’s one of my favorite genres now, they are a lot of fun. The first book in this series was really good and while this one was good too, it just wasn’t quite as good as the first book. I hope you give a cozy mystery a try eventually! The first book did take place at the B&B, which was great. The unrealistic part was a task the main character had to do, but it felt a bit off that she had to this now and that never anyone else had done it earlier. Hmmmm…. I’m between reads and a cozy sounds great actually. Thanks! I hope you can find a good cozy to read! Oh that’s a little disappointing. It is hard when there are too many characters and you can’t recall all of them. I’ve had that before and very frustrating. Same with not being at the b&b. I would want more there, too, I think. Hope the next is better for ya! anna @ herding cats & burning soup recently posted…Buy the Book– New Releases & Book Deals! I would’ve liked a bit more reminders at the start of the book so it would’ve bee easier to remember all of them. I hope the next one will take place at the B&B again, so I am hoping that one is better again. Sorry to hear this one wasn’t as good as the first one. Having too many characters can often spoil a mystery, especially when there’s a mix between old characters and new characters. Yes there were just a few too many characters in this one, it was hard to keep track of them. I did like the old characters once I remember who was who again, but didn’t care as much for the newer ones.